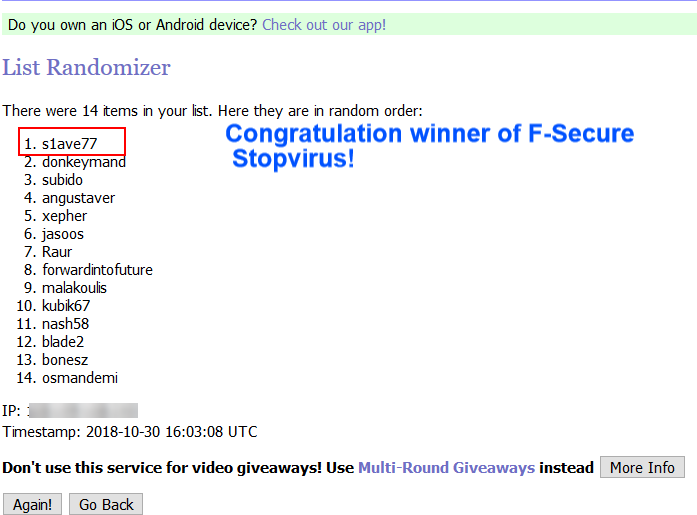 [CONCLUDED] [Personal giveaway] of F-Secure Stopvirus 1 year subscription. Discussion in 'Giveaways and Contests' started by sid_16, Oct 25, 2018. I'm hosting this giveaway on behalf of Tito . A big thanks to him! There is no specific rule for this giveaway. Just comment why do you need it in this thread. The giveaway will run for 5 days. The winner will be announced using random.org on 30th October. The winner needs an immediate response otherwise the license will be given to the next person in order of the list. Thanks for this give Away, I use defender and would like to have a chance to win F-Secure Stopvirus 1 year subscription. My current Eset subscription expires in 7 days so I would love to win this license. Thanks a lot for this personal giveaway @sid_16 . I'd like to win 1-year F-Secure license in case my trial antivirus software expires soon. Please count me in! I need an F-Secure Stopvirus license to protect my surfing, banking and online shopping. Thanks to OP and @Tito. Would like to test this, still looking for the smallest foot-print-AV. One of the most respected brand in the security industry. Has one of the best behavior blocking technology. I would like to win this great product. Oh god, you are great!! Thanks!. I would love this offer since my antivirus is about to expire. Thanks in advance. Good luck to all. You've 2days to claim your win. Just thought i might check in to see what happend . This is indeed nice . Thanks to @Tito and @sid_16 for the giveaway . The license is given away to the winner.